Joshua Henkin gives good book group. Although my book club always meets at restaurants (as I've said, we're lazy), I recently entreated the gals to make an exception and meet at my house so we could "invite" Joshua Henkin. He's the author of MATRIMONY (a New York Times notable book - you know how I love to name-drop) and calls in to book clubs all over the country. I figured this would be a very hard sell (my house = I'm cooking, after all), but they readily agreed. The gals were particularly impressed with how warm and open Josh is. He teaches writing and we all commented that he must be a fabulous teacher, using words like: "astute," "conversational," "helpful" and "generous with his time". What was most interesting to me was that even for the one person who didn't finish the book (she never finishes any book, except mine - well... she said she finished mine. It's not like there was a test or anything), it was still an amazing evening. I truly had no idea how wonderful it can be to discuss an author's work with him and can only hope the clubs I call into have half the experience Josh gave mine. As our "senior member" (in terms of time with the group, not age - although she did just have a milestone birthday), Susan, commented: It helped bring a new level of interaction and discussion to our group that otherwise wouldn't have happened. Having the author answer questions about his book was a great way to have more depth and understanding. 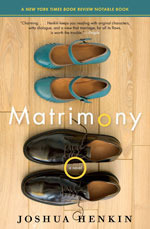 All book groups should invite the author of their current monthly book at least once if they haven't already done so - and MATRIMONY is a great way to start! This page contains a single entry from the blog posted on June 19, 2009 4:50 PM. The previous post in this blog was Queens of... Various Things . The next post in this blog is Book Club Connections.